Sophomore goalkeeper Jenna Oler and sophomore defender Cassie Scandalios attempt to prevent a California goal. Lacrosse suffered a tough loss against California Friday afternoon. The Colonials (1-3) were defeated by the Golden Bears (2-4) 15–8 at home. The Colonials relinquished 10 goals in the opening half of the game, making it impossible for the Colonials to make up the lost ground. “They’re a Pac-12 team. We knew it was going to be a tough game,” head coach Tracy Coyne said. Sophomore midfielder Ioanna Mantzouratos and freshman midfielder Tori Hampton netted two goals apiece. Sophomore midfielder Catie Perkins also dished out two assists while sophomore goalkeeper Jenna Oler accumulated 12 saves over the course of the game. The Colonials endured a four-goal offensive onslaught by the Golden Bears in the opening 10 minutes of play. After calling a timeout, the Colonials forced themselves back into the game and Mantzouratos scored the team’s first goal to give her team the chance to recover with 20:06 left before halftime. As the game progressed, both teams traded goals in the middle of the half, and the Colonials came within two of the Golden Bears 5–3 after sophomore midfielder Abby Carlin found the back of the net with less than seven minutes left of play. But GW stumbled once more toward the end of the half. With 6:19 left in the half, the momentum shifted again in California’s favor. An aggressive blitz by the Golden Bears netted three goals almost entirely within a one-minute window with about two minutes left before the half. The Colonials headed to the locker room trailing 10–3. In the second half, the Colonials stepped back onto the field looking revitalized. After conceding an early goal, the Colonials managed to match California’s aggression. Each team scored five goals in the half. 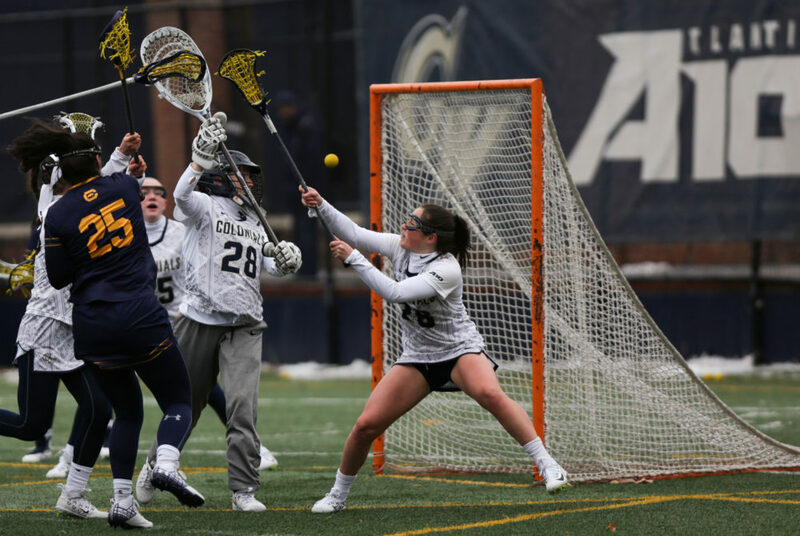 Following another two goals by the Bears that put them up 13–5 with about 15 minutes left to play, Hampton racked up two goals of her own in rapid response to nudge GW closer 13–7. But the deficit was too much for the Colonials to overcome before the final whistle blew. The Colonials will be back in action against Georgetown at 3.p.m. Tuesday.